Pope Francis will pay a visit to Morocco on March 30-31 during which he will meet King Mohammed VI who also has the religious title of Commander of the Faithful. The visit puts the Kingdom on the forefront of international efforts to promote inter-religious dialogue. Under the leadership of King Mohammed VI, Morocco stood out in the region as a haven of promoting the genuine values of moderate Islam and has undertaken efforts to preserve the centuries-old tradition of religious tolerance between Muslims, Jews and Christians. Pope Francis visit to Morocco comes thirty-four years after the visit of John Paul II in the Kingdom. This new historic visit of the Pope will include a significant interfaith forum. 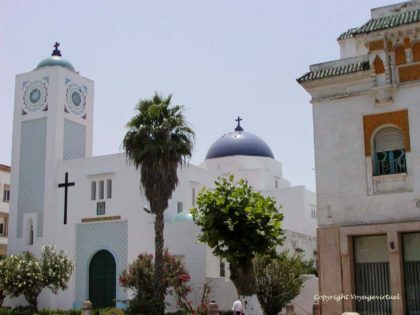 A moment that will allow this message of peace between Christians and Muslims to live on and which will confirm the tradition of welcome and understanding that has characterized the relations of Morocco with the Catholic Church for centuries, the Catholic church in Rabat said in a statement. Prior to being an overwhelmingly Muslim country, Morocco was a land of Christianity and Judaism. The visit will also highlight the friendly ties between Morocco and the Vatican, which were formally established in 1976 although relations between Moroccan sovereigns and the Catholic Church date as far back as the Almoravids era (1061-1147). In 1980, late King Hassan II was the first Muslim monarch to visit the Vatican. King Mohammed VI visited the Vatican in 2000. One of the main highlights of the Pope’s trip to Rabat will be a direct meeting with the Moroccan people from the yard of Hassan mosque where the Pope will address the crowds before standing for a moment of silent contemplation at the grave of late Kings Hassan II and his father Mohammed V.
A visit to the Mohammed VI Institute for the Training of Imams for meetings with Islamic counsellors and imams is also on the Pope’s agenda. The Pope will also show support to charities, including Caritas, which has been lending support to migrants mostly from Sub-Saharan Africa. According to archbishops of Morocco, there are some 30,000 Catholics in Morocco most of whom from Sub-Saharan Africa. The Pope will also hold a prayer at a covered stadium in Rabat. The prayer will be broadcasted live across the globe.